I’ve written about my relentless friend, Bonnie (pen name B.J. Myrick) before. Those articles have centered on how she prodded me to write. This week, Bonnie did something amazing. She published Angel of Mercy, a mystery novel completed in 2003 and lost in the mail following a computer crash. The story began (or would that be ended) with Bonnie completing the final draft of Angel of Mercy in 2003. She had barely finished celebrating her accomplishment when the blue screen of computer death flashed in front of her. Nothing could resuscitate the hard drive. That’s when having a computer-tech daughter came in handy. Or maybe not. Saying she could retrieve the files, Bonnie’s daughter urged her to send the dead hard drive to her. Bonnie bundled the computer for mailing and took it to the local post office. The package never arrived at her daughter’s house. A tracking number had not been given at the time of mailing. The hard drive with manuscript inside was lost. Many people would have given up at this point. In fact, the loss stopped even relentless Bonnie for a few weeks. But then she remembered her online critique group and wondered how frequently we deleted the critique files she sent us. She hit the jackpot. She was able to gather all but two chapters from the four members in the group, enough to reassemble the novel. But a new obstacle, a family crisis, blocked her writing path. Her older sister became disabled and moved in with Bonnie. Caregiving became a round-the-clock, unpaid job and left Bonnie no time or energy for work on Angel of Mercy. After six years, her sister’s condition deteriorated to the point Bonnie could no longer care for her at home. Reluctantly, she found a nursing home and had her admitted. It took a few weeks, but Bonnie finally started work on Angel of Mercy again. She finished it the beginning of this month, October 2015. Just as she was about to upload to Create Space, the computer screen froze. After much mouse-clicking and rebooting, she was able to get some movement. Next, she dumped many files and a new program that might have been responsible for the problem. Finally, she got the machine working again. With some relief, Bonnie started the publishing process on Create Space—but her upload speed was too slow. Discouraged, she called me. After some discussion, she sent me the files, and I uploaded them for her. Twelve years after the book was first completed, Angel of Mercy is now available in e-book and paperback on Amazon and Create Space. Check it out and you’ll find Emma McBride, the main character, as relentless and feisty as her author. 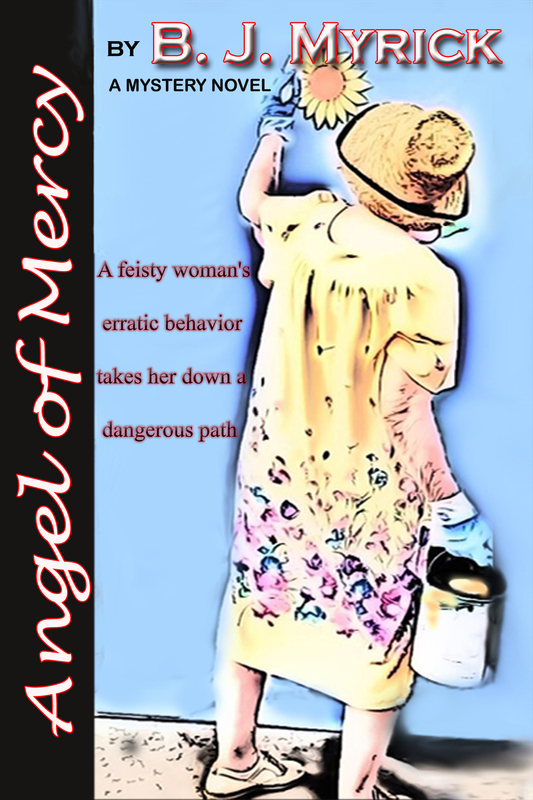 This entry was posted in eBook Publishing, Fiction Writing and tagged Angel of Mercy, aspiring writers, B.J. Myrick, seasoned aspirer. Bookmark the permalink. Wow, that is amazing. Perseverance required!